“This is awesome,” said Brendan Eder ’19, moments after setting eyes on a tabletop glowing brightly in a darkened room in Wegmans Hall. 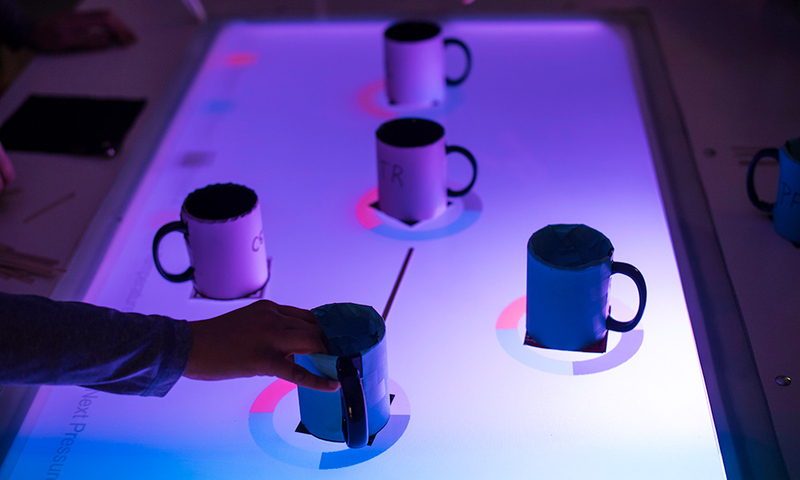 The chemical engineering major from Milwaukee, Wisconsin, repeated that comment more than once during the next half hour, as he and two other students continually rearranged coffee mugs and popsicle sticks on the tabletop’s glass surface to simulate reactions in a real-life, sprawling chemical plant. and a projector inside the table flashed the results onto the tabletop—all in real time. “We’re trying to use AR as a way to enable new types of STEM (science, technology, engineering, and math) undergraduate laboratories that weren’t possible before,” explains Andrew White, assistant professor of chemical engineering. More important, however, is the effect the table could have on optimizing the students’ educational experience. 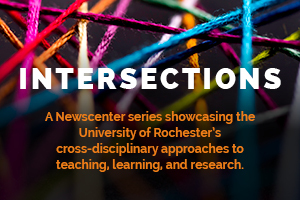 “This is a really a needed piece in higher education,” says April Luehmann, an associate professor and director of secondary science education at the Warner School of Education, who is collaborating on the project. “We know a lot about what’s important in learning that doesn’t ever get translated into the classroom,” she says. Opportunities to engage in dialogue with fellow learners; to make mistakes; to wrestle with complex, real-life problems that have no single answer; and to physically interact in an environment—all of these should be part of the process, she says. “A table like this can allow so much more than that to happen,” Luehmann says. Eventually, the table will be connected to the University’s super computer, allowing for even more sophisticated simulations, says Brendan Mort, director of the Center for Integrated Computing (CIRC), who is also collaborating on the project. White, Luehmann, and Mort have also proposed working with the Rochester Museum & Science Center on developing an AR platform simulating oil and water at the molecular level, to show what happens when there’s an oil spill. and export their work as websites, PDFs, or slideshows. And they don’t have to spend $160 or more for the textbook that would otherwise be used to the teach the class. 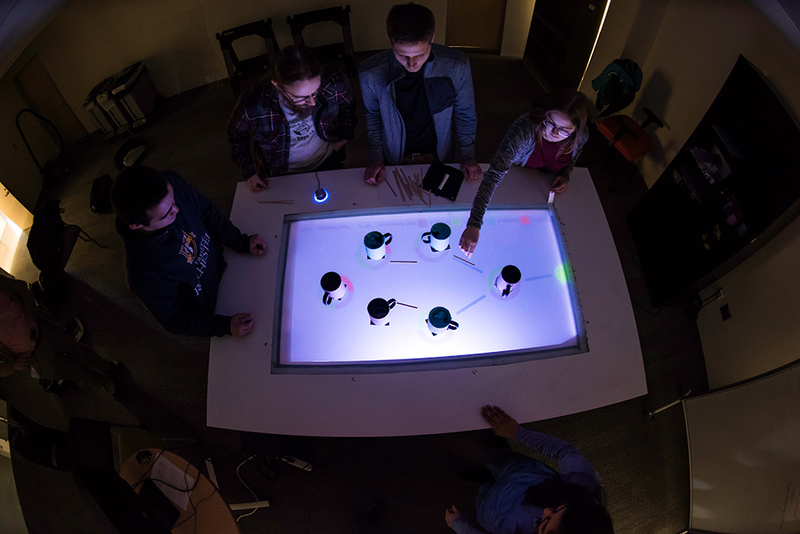 To assess the effectiveness of the AR table as a teaching tool, members of Luehmann’s research team conducted an experiment. They videotaped four students doing a task at the table, while a control group of four other students addressed the same task in a classroom, using computers, spreadsheets, and white boards. About 30 minutes into the exercise, Luehmann’s team noticed that as the students at the table leaned in to reconfigure the reactors and pipes, they would say something like, “how about . . .”—and then move a reactor without even finishing the sentence. Luehmann’s team is still analyzing the videos, as well as the pre- and post-experiment surveys and interviews with the students involved in the exercise. 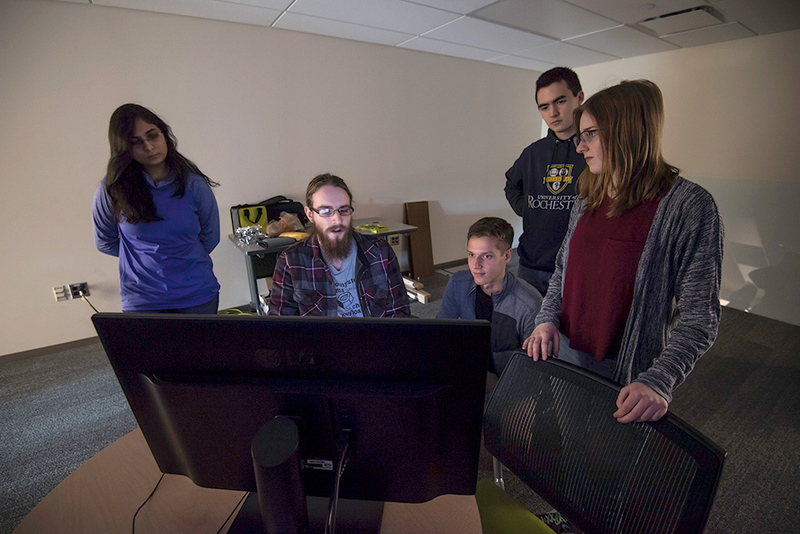 The results will help the team refine its methodologies for further assessing the table’s effectiveness when it is used as part of a chemical engineering class later this semester.